This is a condition in the blood in which the bone marrow ceases to produce adequate blood cells for the replacement of those dying or damaged ones. Any cells that exist in the body, including the blood cells will become old and die in a certain period. Normally, red blood cells live in the body for around 120 days, platelets for about 144 hours, or 6 days, and white blood cells in a span of 24 hours. The purpose of the bone marrow in the body is to supply red blood cells to aid other functions such as tissue oxygenation, strengthen immunity and many others. Anemia is commonly known as the lack of red blood cells. On the other hand, aplastic anemia is the lack of all the cells that comprise the blood- that is, the platelets, the white and the red blood cells. It is because of the bone marrow’s incapability to produce and replace the ones which grew old or died. This could be acquired over time, or could be hereditary. It is not impossible to have this blood disorder, and others actually have this blood disorder before the symptoms could be seen. If not given attention, this problem could be very life threatening. Among US and Asian countries, it is the Asia which has more aplastic anemia sufferers- 15 in every 1 million people, while 3 in every 1 million people is affected in the US. The signs and symptoms which could be seen in aplastic anemia may differ, and it all depends which blood cells are lacking. Symptoms and signs could be mild, or could be severe depending on the mature blood cells that remain in the body. The body only uses those blood cells which are mature, and so even if the normal count is reached, if those cells are not mature enough for the use of the body, the patient will continue to have the symptoms. If the patient lacks red blood cells, he/she will experience any of these symptoms: body weakness, paleness of the skin, shortness of breath and fatigue. If white blood cells are lacking, there would be infections, fever or other pathogen-related conditions because of lack of immunity. Platelet or thrombocyte shortage on the other hand causes bruising, hematoma, bleeding or visible red minute spots in the body. Anemia is not the lack of blood as a whole- it is the lack of red blood cells. Leukopenia is the term used for those who have deficiency of the white blood cells. Those who have lack of platelets have thrombocytopenia. Those who are suffering from any of these blood diseases might experience any of these: fast heartbeat and pulse, murmuring of the heart or arrythmia, bluish or pale fingernails because of lack of tissue perfusion, nosebleeding, gum bleeding, vomiting or nausea, bloody stool, headache, dizziness, tenderness of the sinus, slow healing of the wounds (with excessive bleeding), enlarged liver or spleen, and oral thrush. Some of these symptoms should not be taken lightly, particularly heavy internal bleeding and irregular heart rhythm as these symptoms could lead to other fatal health problems. There are three classifications of aplastic anemia: mild, moderate and severe. The aplastic anemia would be considered mild if the blood cell levels reach the rate below normal. However, in some unfortunate cases, the rate could continue to drop and become alarmingly severe, thus requiring medical attention. Furthermore, there are two types of aplastic anemia: acquired aplastic anemia, which is developed during the lifetime, and hereditary aplastic anemia which is developed since birth or conception. Acquired aplastic anemia is the more common type, and the treatable one. This type could be acquired from being exposed to chemicals and other toxic materials or radiation. 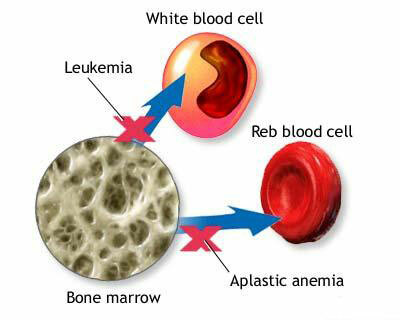 Other causes of this type of aplastic anemia could be chemotherapy medications and viral infections. There are also cases in which the origin remains to be a mystery. Aplastic anemia should not be taken for granted. However, mild or moderate cases does not need immediate hospitalization. To provide the easiest way for treatment to patients, they are transfused with blood. This is rather a way to alleviate the patient’s condition and provide the support needed from blood cells. Immunosuppresant medications could also be very helpful if the anemia is caused by white blood cells that attack and destroy the function of the bone marrow. To name a few of these medications: Gengraf, Sandimmune, Medrol, Thymoglobulin, Cyclosporine, and many others. These medications enable the bone marrow to make new and healthy blood cells. There are also medications which stimulate the bone marrow in producing more new and healthy blood cells. Few examples are epoetin alfa, sagramostim and filgrastim. In the case of a low white blood cell count, antibiotics could be administered to fight the infection. In severe cases, and to those not cured by medications, bone marrow transplant could be an option. This is a costly procedure in which healthy bone marrow from the donor is given to the patient. This process would enable the patient to produce new and healthy blood cells within 3 to 4 weeks after the transplant. To increase the chances of healing and to avoid the rejection of the bone marrow, the patient will be given certain medications, and is put away from chemicals and radiation for faster recovery. Aplastic anemia, once acquired should be immediately treated, as most severe cases causes death when the body does not respond well to the treatment. Since anyone could have it, people should be cautious about the medicines they take and the chemicals they are currently exposed to. In the case of a hereditary aplastic anemia, a careful family planning should be carried out for the child to avoid having the disease during conception.